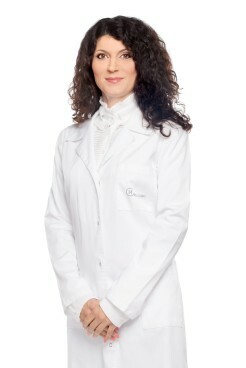 Dr. Eleonora Valyanova is a specialist in aesthetic dermatology at Hill Clinic. Graduated in medicine in Sofia in 1997. Specialized in dermatology and venereology in 2005. Chosen as reference physician for injection of Teoxane fillers for Bulgaria in 2015. Additional qualification acquired at international training courses and practical seminars in Madrid and Prague. 2009 – Certificate for participation in the National Summer Academy of Practical Aesthetic Dermatology and Medicine. 2010 – Certificate for Elos Technology from Syneron. 2009 and 2010 – Certificate for Applification of All Dermal Fillers from Allergan. Holds certificates from the Summer Academy for Practical Dermatology and Aesthetic Surgey in Paris and the European Academy of Dermatology and Venereology. Participates in all major international congresses and forums in her field.